I just finished a great read! Saddled by: Susan Richards (isbn 978-0-547-24172-2 ) What a good way to kick off summer, by reading a book that keeps you enthralled until the last page. You understand that it was the title and the absolutley elegant horse head on the cover that made me pick it up. 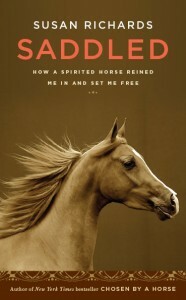 I pick up every horse book, but it is the story unfolded on the inside that made me read with such interest. A life to bear in unbelieveable personal battles is revealed here in Susan’s words so carefully crafted into story. It could be a study in the effects of Alcoholism, its pervasive damage across generations and that would sound like a hard read. Susan found the life jacket she needed to pull herself out of that swirl wrapped in the chestnut coat and mane of her dear Morgan horse Georgia. It is the relationship of Susan and Georgia that makes this healing story a must read. http://www.susan-richards.com/ Follow the weblink to learn more about Susan’s books, I am! Now pull out the library card and settle back in the hammock for a great read – enjoy. Next up for me, her book, Chosen By A Horse.